Tis’ the season for family, friends, parties and hot drinks to keep you warm during the cold weather. I usually have a holiday party between Thanksgiving and Christmas for my friends but the calendar just wasn’t in my favor. There wasn’t a weekend where enough people were free to have a party, so I’ll just have to host something early next year. When you have guests over, you don’t want to be running back and forth into the kitchen to prepare drinks for your friends while pulling dishes out of the oven and getting them plated. You’d much rather talk to your guests and get everything out for them to enjoy while it’s still the correct temperature, right? 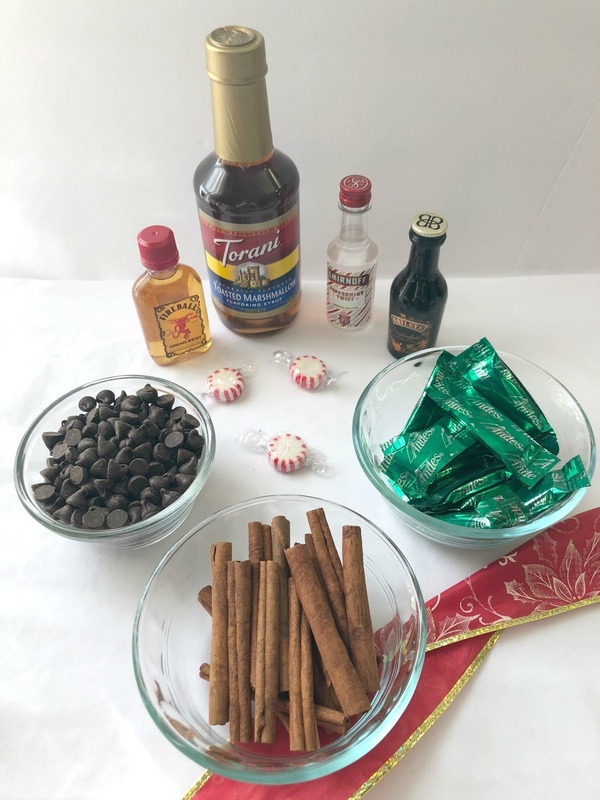 One of the easiest things you can do to avoid this, is to create a drink station or bar where your guests can create their own drinks. There are probably a gazillion varieties you could use. 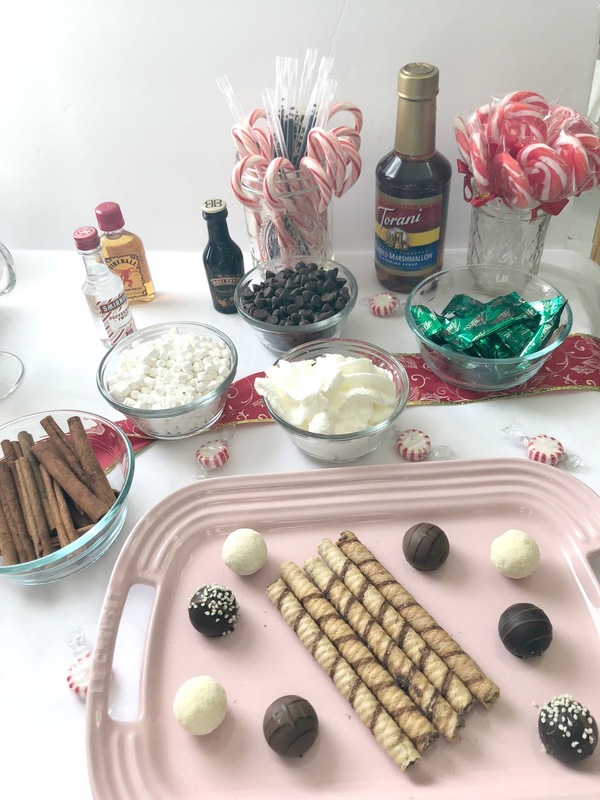 There’s your standard alcohol bar where guests can simply pour their favorite spirit over some ice or where they can add in fruits, syrups, sodas, etc. There’s also a coffee and tea bar where you can offer your guests anything from regular and decaf to chai or peppermint tea. Then there’s my favorite, the hot chocolate bar. I love hot chocolate. And I love the things you can mix into hot chocolate nearly as much as the drink itself. Then there’s the set up. 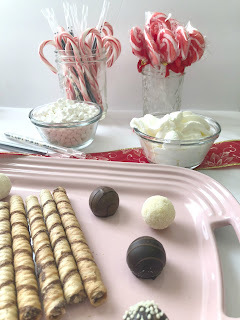 Your hot chocolate bar can be as simple or indulgent as you’d like. It all depends on what you’d like to purchase for your guests and your design style. While my house is decorated in what I call coastal contemporary and I simply cannot pick two holiday colors to stick with, I went with what I call holiday whimsical for my hot chocolate bar. Speaking of design, check out Havenly to see which interior designer’s style is most similar to your own. 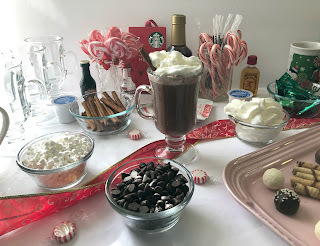 To create your own hot chocolate bar, here’s a list of what I used. Feel free to change it up to be more of your style. 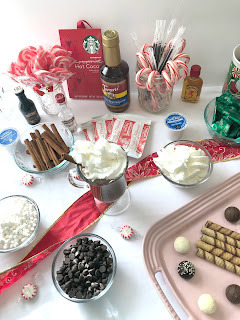 Or of course, to make your own hot chocolate. 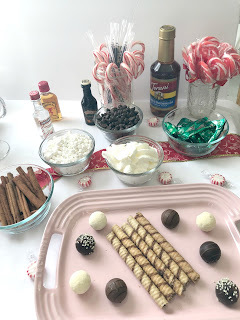 For a party, I would have made a batch of hot chocolate in the crock pot, but since it’s just Tom and I, I decided to go with individual servings for this bar. You can also have a lot of fun with the mugs that you serve your hot chocolate in. 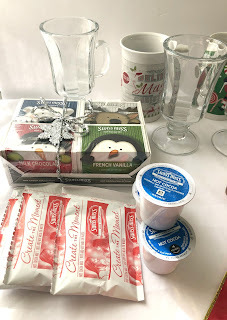 There’s nothing wrong with your classic, white mug but you can also have a little fun with the Irish Whiskey Style Glass mugs, a regular glass mug or even some extra deep ones printed with holiday cheer. If you’re struggling with how you set up your drink station or even a room in your house, you should check out Havenly, a site that helps you design your home. You can look through their client designs, by room or by style to get an idea of what you’d like, or you can take a style quiz that matches you up with one of their interior designers. They work with large and small budgets and have tons of great images to look at on their blog for decor inspiration. I’d like to know what you’d include on your hot chocolate drink station. Leave me a comment or tag me in a pic on IG @cookaholicwife.